Please describe your idea of a perfect date. – “That’s a tough one. I’d have to say April 25. Because it’s not too hot, not too cold, all you need is a light jacket.” – If you know this movie reference, we are officially best friends. And I now expect you to show up every Friday to binge watch “Say Yes To The Dress” while sipping Moscato and eating popcorn. But really, THIS is the exact reason I love fall. In the Summer, it’s too hot and in the winter, it’s too cold. Fall is that PERFECT season between the two where you can basically wear whatever you want and still be comfortable. Want to wear that summer dress that hangs just right? No problem! Ready to rock those UGG Boots that you bought purely because they were “trendy” at the time, but now just love sticking your feet into those soft, pillowy soles? Go on girl, do it! Today I’ve rounded up a few outfits that I put together for my fall wardrobe. You’ll notice some items are repeated through multiple styles or shown in an alternative color. I wanted to give options of how pieces can be styled different ways. Contrary to what we see on Instagram, not every outfit has to entail breaking the bank to look cute. Investing in great staple pieces can help build a classic, versatile and stylish wardrobe – for fall, these includes boots, cardigans, jackets and denim. * Designer Bags: It’s an addiction and my guilty pleasure. But since they aren’t exactly budget friendly, I also linked exact dupes and/or alternative options. Dupes are perfect for those of us who like to be “boujee on a budget”. Outfit number one is probably my favorite. Super classic, chic and timeless. One of those outfits you don’t have to think about too much and can be worn for just about any occasion. White Chiffon Tank – Double layered, versatile and classic. Dark Wash Jeggings – Super comfy, great quality and are a great staple piece. Brown Leather Boots – Cute strap detail and only $45. LV Speedy – Classic, Timeless but also pricey. Brown Leather Tote – Great LV Alternative and goes well with the boots. Layer Necklace – Only $17 and can be styled tons of ways. Outfit number two is a quick style shift from outfit one. Using the same purse, boots and jeans, I just swapped out the camisole for a t-shirt and the cardigan for a utility jacket. A little bit more of a causal look but still super stylish. Utility Jacket – Currently sold out. Linking a similar one. White T-Shirt– Thicker so it’s not see through and only $8. Layer Necklace – Cute, versatile and comes in other colors too. Outfit three re-uses the white t-shirt and necklace from the previous look. Here I’ve swapped out the boots for cute slip on sneakers, a lighter denim, my all time FAVORITE purse (exact dupe linked) and a blue sweater. I love the leopard accent of the sneakers! And they are Kate Spade! Blue Cardigan – Only $20 and comes in lots of colors. Medium Wash Jeggings – Super comfy, great quality and a great staple piece. Leopard Kate Spade Keds – Cute strap detail and only $45. Celine Bag – Classic, Timeless but also pricey. Celine Dupe – An EXACT dupe and SUPER affordable. 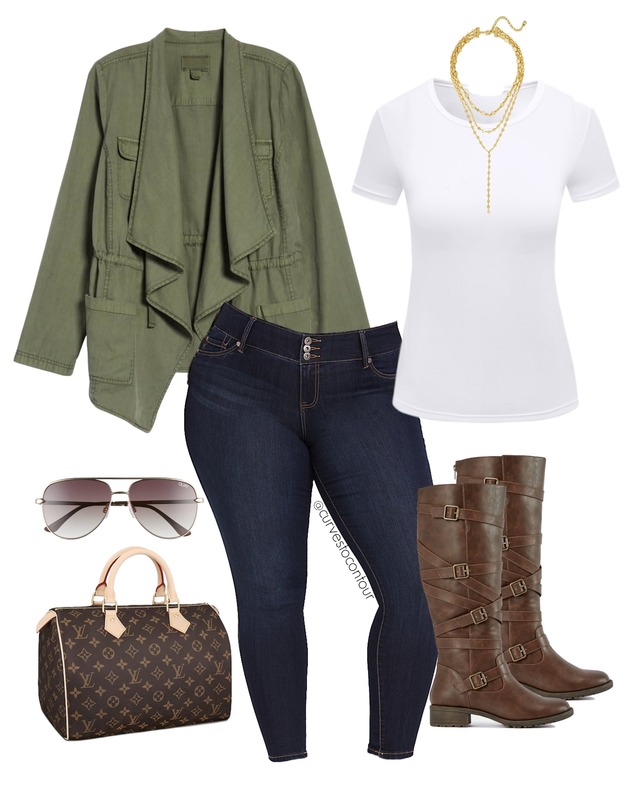 Outfit four utilizes the purse, jeans, shoes and necklace from previous styles. I’ve replaced the t-shirt with a black chiffon camisole and the utility jacket with a gorgeous faux suede moto jacket! Suede Moto Jacket – Only $40 and comes in lots of colors. Black Chiffon Cami– Double layered, versatile and classic. Last but not least, outfit five utilizes the jeans and necklace from previous styles. I’ve swapped the cami for grey t-shirt and added in some classic stone boots and my favorite oversized sweater. 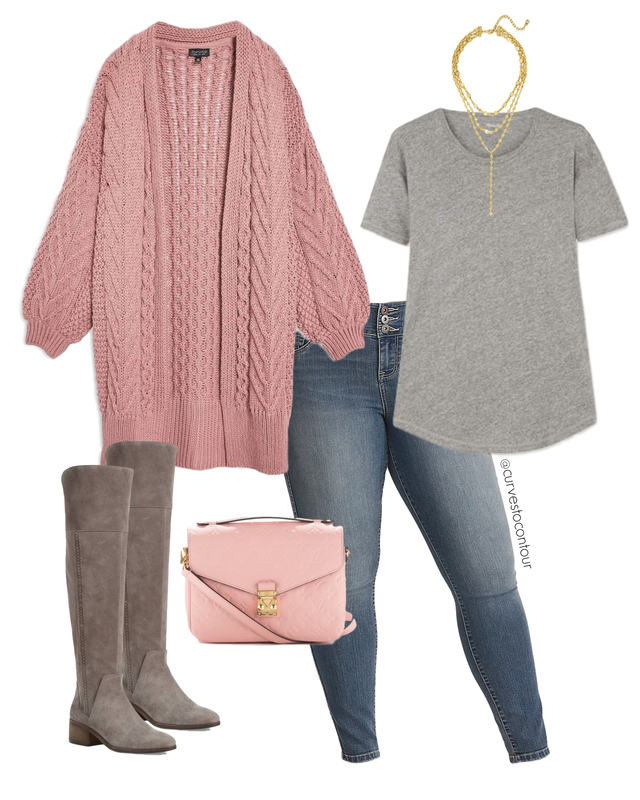 Oversized Pink Sweater – SUPER comfy and cozy! Grey T-Shirt – Target & Old Navy have the best ones. Vince Camuto Stone Boots – Classic and quality but a little pricey. Stone Boots Alternative – A total steal at $45 . LV Bag – Currently sold out. Bag Alternative 1 – A Tory Burch classic bag. Bag Alternative 2 – A quilted “Chanel-esque” bag. Bag Alternative 3 – A “Celine-esque” style bag. So there you have it, my roundup of fall picks. Now may be a good time to confess that I bough the Pocket Cape Cardigan in pretty much EVERY color. I mean, come on….at $20, how could I not?! Anyway, thank you so much for stopping by and I hope you were able to find some great fall staple pieces for your wardrobe or at the very least, some inspiration for styling items you already own.